February is here, and along with the feeling of love that’s currently permeating the air, it’s important to remember that just because it's the middle of winter doesn't mean you can't give your home a little love, as well. Let's start inside with projects that can be done right now. The folks at lunchboxarchitect.com suggest sprucing up your bathroom vanity with a glossy granite vanity top that will cost you as little as $150. Or, spend less than $50 installing lamp dimmers to give you full control of the brightness in any room. Moving along to the laundry room and kitchen, a recent Maytag survey found that 44 percent of millennials and 41 percent of parent homeowners plan to remodel these spaces this winter (compared to 29 percent of all homeowners). 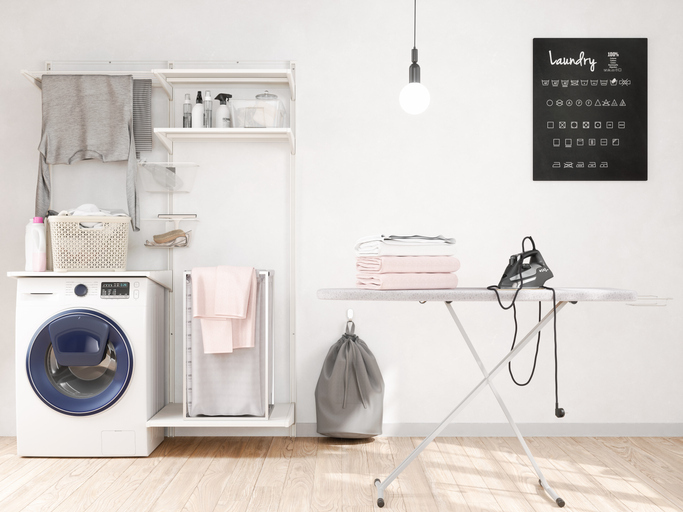 So what are a few practical laundry room spruce-ups you can easily knock out this February? The experts at constructionresourcesusa.com say that if you have front loading appliances, adding a countertop above them will help create the illusion of a larger space, while at the same time providing a smooth, flat surface for doing your folding. .
- Avoid shelving that can make an already cramped laundry room feel claustrophobic. Instead, try hooks to hang your ironing board, or a pegboard if you need space to hang clothes. - Save even more space by mounting a fold-out ironing board with an upper shelf to store your iron higher up on the wall. Just make sure it has room to cool down. - Further expand your drying space by attaching drying racks to your walls that fold out when needed. - Get even more space by installing a tension rod just like you would use to hang a curtain. Leave your hangers on the rod while your clothes wash, and when they’re dry, you can easily hang them and transfer them back to your closet. - Eliminate wasted space by installing pedestal drawers directly underneath your washer and dryer for cleaning supplies, extra towels, or anything that can get a little warm from the dryer. Finally, how about adding some tile? The team at fireclaytile.com says that not only is tile durable and easy to clean, it will also give your laundry area a clean and fresh look when it’s incorporated on almost any surface, including walls, backsplashes, floors and countertops.